Have you visited the kingkong hill Bromo on mount Penanajakan ? Kingkong hill of Bromo on of the alternative place to see the sunrise in Bromo, information is probably the thing you need to know more right now. You might have not visited Bromo, but you have heard a lot about some alternatives places to see beautiful sunrise in Bromo. 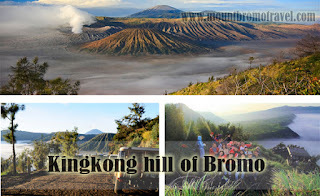 Kingkong hill Bromo is one of those places you must not miss. Only a few tourists know about this place. When visiting mount Bromo east Java, the very first place crosses their mind will be Penanjakan 1 Bromo, the highest place to see sunrise. Whereas there are some other great places to see the Bromo’s morning beauty like Love Hill and Penanjakan 2 Bromo. Let’s get to know more of Kingkong hill of Bromo. Kingkong hill Bromo is familiar with the alternative place to see the sunrise, is also commonly called Bukit Setya. When Penanjakan 1 Bromo is too crowded to visit, this is one strategic place to see sunrise. Its location is only about 2.5 km from the Penanjakan 1 Bromo. But this place is lower than Penanjakan 1 Bromo. In big holidays or certain days like Thursday till Sunday, Penanjakan 1 Bromo is usually crowded. Kingkong hill Bromo (the alternative place to see the sunrise) is great choice to visit althouth maybe the price of the entry ticket is higher than regular days. Why is it called the Kingkong hill Bromo? There is no legal opinion why the places is called the Kingkong hill of Bromo. However, there are some sources that mention that one of the cliffs in the Kingkong hill is similar with the head of a kingkong. Probably that is why it is then called the Kingkong hill. The cliff that is naturally crafted is right behind the limiting fences where tourists stand to see the view. When you take a look at it more carefully, you will see eyes and nose that are similar with the ones belong to a kingkong. The access to this place is quiet easy. Compared to Penanjakan 1 Bromo, the access to Kingkong hill is much easier than to Penanjakan 1 Bromo. From the jeep parking lot, we only have to walk as far as 200 m. While to Penanjakan 2 Bromo, we must walk for 700 m. Getting more interested in Kingkong hill of Bromo (the alternative place to see the sunrise)?